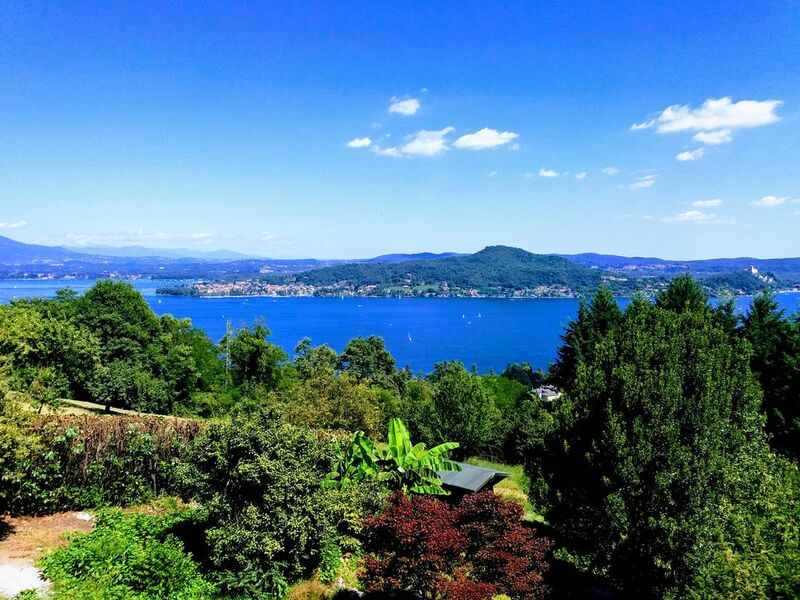 Lake Maggiore with a wonderful terrace overlooking Lake Maggiore. I have published this whole villa for an ideal stay for four people. However, there are 2 more beds available, plus a folding cot for children, which are available for free in the living area. This area has no blackout curtains. However, it is a very suggestive situation for a good rest, thanks to natural light and the silence of nature. wide solarium terrace fenced, with table, chairs, deckchairs area grill. The house has all the comforts. and is therefore ideal for long stay. Es ist ein Ort voller Charming, wo Sie Ruhe finden können. Lange Aufenthalte sind ideal, aber wenn Sie diese Orte genossen haben, bin ich sicher, dass Sie zurückkommen werden. Es ist Magie. A terrace with a spectacular panorama. A surprising green space. A vessel for traveling in inner worlds. The enchanted place to live a sensory experience. Peace harmony tranquility nature. Adriana make sure we had everything we could possibly need to make our stay memorable and comfortable including an extremely generous welcome pack and a list of places to go. The icing on the cake was the surprise birthday dinner I asked Adriana to arrange for my husband at Pratone. The seven course Italian feast was delicious with amazing service and a lot of laughs. I would recommend Pratone to anyone. Das Haus hat eine ganz wunderbare Lage, der Blick auf den See von den beiden Terassen ist einfach toll und das Grundstück riesig. Die Ausstattung ist perfekt. Die Vermieterin ist wirklich sehr nett. Als wir ankamen, war der Kühlschrank lecker gefüllt, es gab Kuchen, Obst, Nudeln, Wein, Sekt ..... Eigentlich hätten wir unseren einwöchigen Aufenthalt ohne weitere Einkäufe bestreiten können. Die Lage ist perfekt für viele Ausflüge, aber eigentlich will man das Haus gar nicht verlassen. Ein wunderschöner Urlaub. Danke. Es war eine wahre Freude, Sie willkommen zu heißen. Vue extraordinaire, maison confortable cosy pleine de surprises et d’attentions. Maison très spacieuse à l'étage avec une très belle vue de la terrasse et un grand open space à l'intérieur avec une très belle charpente en bois, grand terrain. Les chambres au rez de chaussée bénéficient elles aussi d'une terrasse mais sont un peu petites. À noter que le stationnement sous le porche de la maison doit se faire uniquement en marche arrière et le coffre de toit doit être retiré. Accueil très chaleureux d'Adriana avec énormément de petites attentions pour les vacanciers. Nous la remercions encore pour tous les produits locaux mis gratuitement à notre disposition pour notre pour notre plus grand plaisir. Nous avons vraiment eu le sentiment d'être chez nous ! Très belle maison calme et fonctionnelle. Très belle pièce à vivre, chambres très confortables. Grande terrasse avec une vue imprenable sur le lac majeur. Excellent accueil de la part d'Adriana Chiari. De nombreuses petites attentions nous ont rendu le séjour encore plus agréable. Propriétaire discrète mais très disponible. Une maison originale à ne pas manquer. Hilly area on the Piedmont bank of Lake Maggiore. surrounded by chestnut woods and pastures. ancient villages and spectacular views of the lake and the mountains. quiet area and relaxing in contact with nature. The area is the hilly Alpine part of the Upper Austrian. an important area historically, because it was the route of the slope of the Alps. The lakes of this area are called alpine lakes as of morainic origin. Up to 1800 in the area between Verbania and Stresa there were 8 public therapeutic thermal springs! Pascoli vineyards parks, now in disuse or semi-abandoned grounds, testify to the presence of an extraordinary microclimate. Why not live it and animate it with splendor? La tassa di soggiorno viene versata in contanti all'arrivo .